Ramakian (Ramayana in India) is the tale of the God Vishnu who incarnated as Rama to punish the Yaksa Totsagan. This is the story of Phra Ram and his Consort Sita (Naang Siidaa). Ramakian is one of the foundations of Buddhist Literature in Thailand, and is taught in every Primary school. The Ramayana, came to Southeast Asia by means of Indian traders and scholars who traded with the kingdoms of Khmer (such as Funan and Angkor) and Java (Srivijaya), with whom the Indians shared close economic and cultural ties. The spread and popularity of Ramayana over the centuries may be seen in the number of variations of the story in the region. By the Dhonburi period of Thai history, the Thai version of the Ramayana (The Story of Rama) had been renamed Ramakien (The Glory of Rama) while the same story became known as Ram-Lak in the Lao version. Although older versions of Ramakien are extant, such as a book dated to the Dhonburi period, the most complete version of the Ramakien is the "Rama I version", an epic poem composed by King Rama I in the 18th century. In the late first millennium, the epic was adopted by the Thai people, who had migrated to Southeast Asia from southern China. The oldest recordings of the early Sukhothai kingdom, dating from the thirteenth century, include stories from the Ramayana legends. The history of the legends was told in the shade theater (Thai: หนัง, Nang), a shadow-puppet show in a style adopted from Indonesia, in which the characters were portrayed by leather dolls manipulated to cast shadows on a nearby screen while the spectators watched from the other side. The Thai version of the legends were first written down in eighteenth century, during the Ayutthaya kingdom, following the demise of the Sukhothai government. Most editions, however, were lost when the city of Ayutthaya was destroyed by armies from Burma (modern Myanmar) in the year 1767. The version recognized today was compiled in the kingdom of Siam under the supervision of King Rama I (1736-1809), the founder of the Chakri dynasty, which still maintains the throne of Thailand. Between the years of 1797 and 1807, Rama I supervised the writing of the well-known edition and even wrote parts of it. It was also under the reign of Rama I that construction began on the Thai Grand Palace in Bangkok, which includes the grounds of the Wat Phra Kaew, the Temple of the Emerald Buddha. 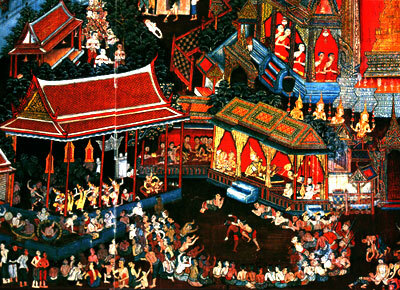 The walls of the Wat Phra Kaew are lavishly decorated with paintings representing stories from the Ramakien. 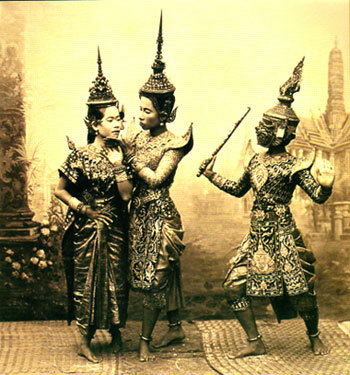 Rama II (1766-1824) further adapted his father's edition of the Ramakien for the khon drama, a form of theater performed by non-speaking Thai dancers with elaborate costumes and masks. Narrations from the Ramakien were read by a chorus to one side of the stage. This version differ slightly from the one compiled by Rama I, giving an expanded role to Hanuman, the god-king of the apes, and adding a happy ending. Since its introduction to the Thai people, the Ramakien has become a firm component of the culture. Though many consider it only an adaptation of a strange work from an archaic system of beliefs, it is firmly embedded in the cultural history of the country and the people. The Ramakien of Rama I is considered one of the masterpieces of the Thai literature. It is still read, and is taught in the country's schools.